Durgin's of Maine is Proud to offer fine Maine Gemstones, and multicolor Tourmaline slices set in some exciting new custom designs created specifically to embrace and accentuate these phenomenal gems. Many of our finest Maine tourmaline gemstones are cut by local craftsmen here in Northern New England. All of our custom jewelry designs are fashioned by local Maine craftsmen. Our Wine Frozen-in-Time™ Jewelry Collection features a recent find of uniquely colored Mt. Marie Maine Watermelon Tourmaline set in a new theme of handmade jewelry. Every piece is one of a kind! Our Firefly Tourmaline™Jewelry Collection is still in the creation phase. We are so excited to share this phenomenal Mt. Marie Maine Tourmaline Species that glows like a firefly in low light that we are introducing the faceted gemstones here for your viewing. Firefly Designs will be coming soon! 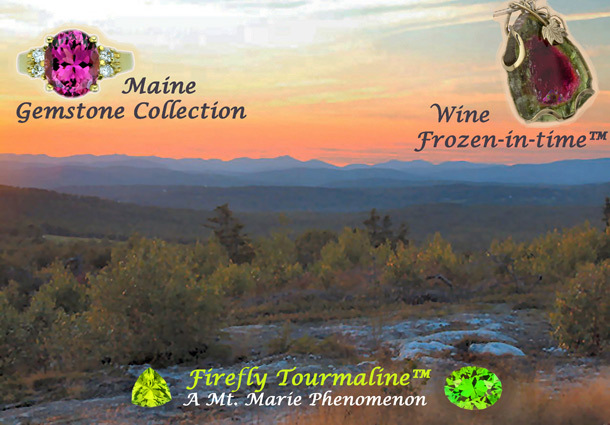 Our Maine Gemstone Jewelry Includes various designs incorporating Maine tourmaline and other gems from Mt. Marie and other Maine locations. All of our Maine tourmaline gems are natural untreated (except for cutting).